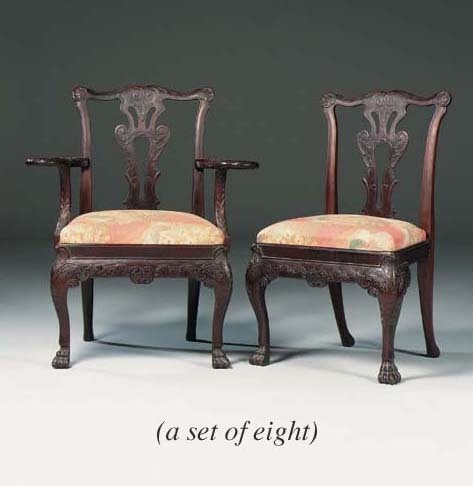 This set of chairs, possibly made by a firm such as Michael Butler of Dublin, have many of the characteristics of Irish furniture and are closely based on Irish chairs of the mid-18th Century. The square lion-paw foot, flatly carved apron and pierced vase-shaped splat and 'open' scrolls at the top of the legs are all features found on Irish furniture, as well as the scrolling Jupiter's eagle on the arms, often seen on 18th Century Irish mirrors. The Butler firm specialized in reproducing Irish 18th Century furniture as well as retailing furniture. There is a related 18th Century chair at Malahide Castle, Dublin illustrated in G. Kenyon, The Irish Furniture at Malahide Castle, Dublin, 1994, pp. 92-92.